Carta abierta a los lideres europeos. Hace tiempo que no publico nada en el blog, y no será por falta de noticias. Simplemente ya no es primicia nada de lo que yo pudiera decir, puesto que lo único que se podía añadir es que salen noticias día si y día también que confirman nuestros peores augurios. No merecía la pena revolcarse en el "veis como tenía razón" ni alegrarse de ello como si fuera un éxito, porque en realidad el hundimiento social y económico que se avecina (si no hacemos nada) es un fracaso de todos. Lo "bueno" que tienen las ciencias sociales en general, y la economía en particular, es que hacer previsiones certeras te sirve para evitar que las catástrofes sucedan, siempre y cuando logres hacer que esas previsiones lleguen a las personas oportunas. Pero esas personas, en buena lógica, no te hacen ni caso salvo que les des una solución. De poco sirve señalar la existencia de un problema, si no tiene solución. Con eso en mente, me he devanado los sesos para intentar encontrar una solución que pueda ser aceptable para todos los actores implicados, y que a la vez no perjudique el futuro de ninguno de ellos. Y he escrito una carta que voy a enviar a las pocas personas con acceso al poder que conozco. Disculpad si es muy larga, y disculpad que esté en inglés, pero creo que tanto la longitud como la lengua en que está escrita son condiciones necesarias para que realmente pueda tener algún efecto. Sois libres de reenviarla a quien creais conveniente. You all know we are in the brink of EU destruction, as the economic survival of some countries depends on the economic and social suicide of others. In this letter I will try to give my modest opinion about what could be done to solve this puzzle. 1.- Increasing the inflation target to 4% or more: Maybe this would help southern overindebted countries to avoid deflation, but also it would kill the heavy industries of Germany. In the end, we would end being a “new dollar” zone, with permanent trade deficit, unsustainable in the long run, and too unstable to keep on financing our welfare state. 2.- Implementing Rescue plans as needed: It’s politically impossible that northern countries, with their own problems, pay to solve the problems of others without asking something in exchange. And in the nationalist world where we live, it’s also impossible that southern countries pay with sovereignty or territories, which are the only valuable things that they still have. This path is leading EU into loop debates that will never end in consensus, and in a few weeks or months will end in massive defaults, FMI interventions, and political recriminations far away from the red lines of friendship. I am sure this option would destroy the EMU. 3.- Creating the Eurobonds to finance the rescue plans: while maybe this would give us a bit more time, this measure would not solve the problem of competitiveness of southern countries. The permanent trade deficit will finally end in bigger external debts that the EU would not be able to finance, being its budget only a scarce 1% of the GDP. Again, the nationalist paradigm would make impossible to increase this budget for that purpose, as it would be an indirect way to make northern countries pay the bill. Moreover, EU institutions would have to face the fact that there is not any international treaty giving them the power to sell their own treasuries. While all those options are not enough to solve the problem, I have a proposal (in fact a combination of measures) that I strongly believe would solve the problem in the short term and give the EU the tools to prevent situations like this one in the future. First of all, the € should be devalued. 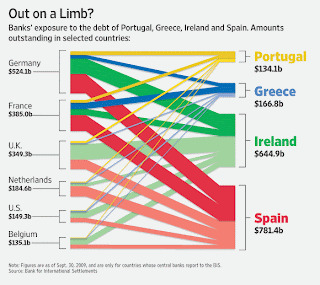 But at least Germany and Holland should leave the eurozone before that devaluation, otherwise it would not work. The next day, they should reenter the eurozone with a different exchange rate (for example 1,5DM=1€, instead of 1,93DM=1€). Only salaries and deposits should be updated, keeping all debts and assets in euros. Of course, German banks should be compensated for this change, but its government would have plenty of money to do that, as its debt would also be smaller after the devaluation of the euro. German economy would suffer less with this increase of the salaries, than it would suffer if the inflation target is raised, as the heavy industries are more intensive in capital needs than in labor costs, and a high inflation would force the ECB to raise the interest rates. Also, this change would be quite acceptable to German citizens, as they would be richer than before without rescuing any country with their taxes. Moreover, this increase of salaries would likely increase the internal demand of Germany, making their economy less dependent on exports. In sum, German people would be rewarded for his savings, competitiveness, and hard work with a higher standard of live. When we talk about devaluing the euro, a question is automatically raised: Why Germany would want to reenter the eurozone? The answer is that this is the only way they have to avoid the problems Japan has had last decades, Germany needs to have at hand a really strong market available, with free trade, and with a currency and institutions they partially control thanks to the EU regulations. Without that, they will suffer a really strong Deutsche Mark, and they will have to buy lots of dollars and euros with their trade surpluses to keep a convenient currency exchange rate. The devaluation of the euro would help southern countries to recover international competitiveness without suffering a painful internal devaluation process, impossible to implement in some countries just because the traditional political behavior of their institutions, parties, and unions. Without this devaluation, the payment of the net external debt is just impossible, as the exports would never grow as quickly as it is needed. Devaluation is also needed by all Eastern Europe, as they have huge amounts of external debt denominated in euros. This kind of devaluation, possibly with the help of some Eurobonds or little financial aid from richest countries, would solve the problem we face in the short and medium term. But we also need to be sure that this will not happen again; we have to implement economic policies to prevent this kind of unbalances. First of all, there should be a “kind of” restriction to trade deficits between every country and the sum of the other countries inside the eurozone. International credit is good when is well invested, but can be really bad if it is used just to finance an unsustainable consumption rate in the poorest countries, which have no means of paying the debt and the interest. Maastricht states: public deficit and debt should be below 3% and 60% of the GDP. Trade deficits and net external debts should also be restricted at some level. This restriction should be proportional to the budget of the EU dedicated to develop the poorest regions, which now is really low if we compare it with the huge amount of net external debt and deficits that all those countries have. With the conditions we have now, net external debt should never be above 60% of the GDP, including private and public debt. In this very moment, many countries are far above that level. Of course, if we really want the EMU remains as a free trade zone (without export quotas), we will be forced to increase that threshold. But if we want to increase that threshold, we have to increase the budget dedicated to the poorest regions and countries, to be sure their net external debt is always payable. One way is to increase the Cohesion Funds. Another option, in my opinion a better one, would be to put some Labor policies in hands of the EMU institutions. An example could be the creation of a European unemployment benefit, which countries would have to fund with a % of their GDP. That way, countries with higher unemployment would receive a direct transfer from the countries that keep a higher rate of labor force. Of course there should be protection mechanisms to make sure no country takes advantage of that kind of policy. EU should watch that everyone that receives that benefit is really a job seeker, and also should keep in mind that after those direct transfers no net contributor is below a net receiver in terms of GDP per capita. These kind of automatic stabilizers are completely necessary to balance the cycles any free market region suffers. These stabilizers exist between regions inside the same country, and must also exist inside the EMU if we all want to become a fully integrated economy. 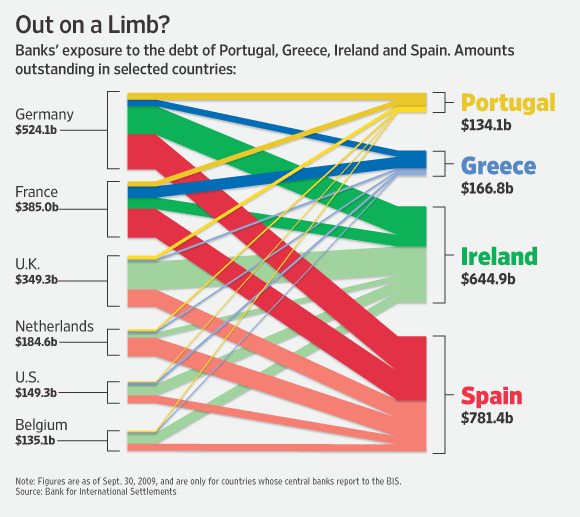 In sum, to solve our long term problems we need automatic stabilizers of the unbalances between countries in the EMU, just as countries have between their different regions. Otherwise, a free trade market with the same currency for different countries would not work and would end in an external debt collapse. Finally, these measures could put the euro in danger in the very long term. The fact that Germany and Holland raise their standards of live could lead Europe into a permanent trade deficit (just as it happens in the USA). This could not be a hard problem in the medium term because we have our own currency, and the net external debt of the eurozone as a whole could always be paid, because it is denominated in euros, which we fully control. But I strongly believe this is a path that would finally end in a necessity to raise the inflation target, and our heavy industries would not survive. We must try to make sure that the eurozone does not have trade deficits against the rest of the world. ECB and other EU economic institutions should permanently keep an eye on that. There is no permanent solution to achieve that kind of stability, but I believe that the emphasis on renewal energies and recycling would help a lot, as we would need less commodities which are a great portion of our imports. In conclusion, at the moment the EMU lacks the necessary economic long term policies to become a stable monetary zone. Obviously, we lack the free currency exchange rate needed in any free trade zone, which would work as an automatic stabilizer between different countries. But we also don’t have enough automatic stabilizers (only the exception of cohesion funds) needed in any monetary zone. First we need to recover the balance, and then we have to make sure it is a stable balance implementing measures that keep it. Otherwise the EU construction process will fail, and the hopes it has bring to so many people and countries will be forgotten. The implications this failure would have for democracy and peace in Europe should not be underestimated. Cuando la verdad llega, la mentira se esconde. Comienzan a proliferar las noticias que avalan nuestras teorías, parece que va a ser cierta la frase de Lincoln “puedes engañar a todas las personas algún tiempo, o a algunas personas todo el tiempo, pero no puedes engañar a todas las personas todo el tiempo”, y la verdad empieza a aflorar. Los medios se hacen eco de algunas de las herramientas utilizadas para esconder parte de la deuda de las administraciones públicas. Mientras la ministra dice que no han usado derivados para tapar temporalmente su deuda, cosa que Grecia si hizo conchabándose con la gran banca internacional, no dice nada de otro tipo de técnicas de ingeniería financiera: empresas de capital público, sobreendeudamiento de los múltiples niveles de la administración, etc. ¿Como impedir que internet sea libre y democrática? que solo los que tienen dinero puedan publicar contenidos en ella. Así es como se "cargaron" la libertad de prensa: convirtiendo los periódicos en empresas, de manera que se autocensuren. ¿Acabaremos viendo una “tasa blog” que nos obligue a pagar por cada visita recibida? Tiempo al tiempo. En unos días veremos sufrir a las empresas productivas, además de los bancos, la liquidez de los bancos centrales se va secando y es imperativo legal y financiero reconocer las perdidas. Tal y como avisa Cuatrecasas (el segundo bufete más importante de Catalunya) en esta noticia. Las preferentes, tan de moda el año pasado, no valen ni el papel en el que están escritos los contratos. Al menos eso dice Moody’s. Las de La Caixa, Santander y BBVA de momento se libran, pero después de lo que pasó con el rating de las titulaciones hipotecarias, habría que ver en profundidad si ese indulto se debe a la situación real de los tres gigantes españoles, o a que su tamaño les permite invertir más en reputación corporativa e informes. En cualquier caso, la rebaja del rating de 32000 millones en preferentes no es moco de pavo. A tenor de los preparativos para su liquidación que hace SAN, que ha hecho “testamento” y se lo ha enviado al Banco de España, no parece que las cuentas de todas sus filiales estén sanas, ¿Se prepara SAN para la quiebra de sus filiales internacionales? ¿O para la quiebra de su negocio en España? Viendo la serie de informes internacionales, que provienen de las instituciones más prestigiosas en materia económica, parece más probable lo segundo que lo primero. Aquí un amigo director de Bridgewater Associates, que dice que ningún país con una deuda exterior del 80% del PIB (en realidad ya vamos por el 90% y creciendo) en una divisa que no controla (nosotros no controlamos el euro) NUNCA HA PAGADO LA DEUDA. Lo venimos diciendo desde hace meses, para pagar la deuda exterior habría que imponer unos cambios económicos tan draconianos, que ningún gobierno democrático va a estar dispuesto a hacerlo. De hecho todavía no se ha hecho nada y los sindicatos ya han salido a la calle… no quiero ni pensar lo que harían si les dijeran que el presupuesto del estado se debe reducir en un 50% y que eso implica echar a la calle a todos los interinos y rebajar el sueldo un 20% a los que se queden… Ardería Troya. Al fin y al cabo, somos mediterráneos y carecemos de la disciplina de los Irlandeses y Letones (en estos países ya se han hecho estas rebajas). No lo conseguirán (ya se ve en Grecia), pero lo intentarán, y se pondrán TODOS de acuerdo para intentarlo. Y lo cojonudo es que a eso lo llaman “pacto de estado” para “salvar el país”. Manda huevos! Por otro lado, tenemos a Rogoff, prestigioso profesor de economía de Harvard, que dice que la deuda pública va camino del colapso, sobretodo a medida que los bancos centrales se vean obligados a reducir las medidas excepcionales de liquidez, como ya está haciendo la FED. Ya salen en los medios de masas afines al gobierno se publican noticias sesgadas sobre la deuda exterior, por ejemplo esta de el periódico, que habla de la deuda pública. Un 55% en manos de bancos, fondos de pensiones, de inversión, y de la seguridad social. Y “solo” un 45% en manos de capital extranjero. Luego se dice que el porcentaje de deuda pública en manos de extranjeros respecto del PIB es muy bajo… nos ha jodido, porque de momento, y si no tenemos en cuenta la deuda oculta mencionada anteriormente, la deuda del gobierno de España es baja respecto del PIB. Eso sí, nadie se pregunta de dónde han venido los fondos que los bancos invierten en deuda pública, y nadie pregunta cuál es la posición global NETA de España, incluidas las empresas privadas. ESE dato es el bueno, porque no se puede separar al gobierno del sector privado cuando el gobierno AVALA a las entidades financieras privadas, y está dispuesto a lo que sea para salvarlas. Ese es el dato que utiliza Bridgewater, y por eso su informe es mucho más riguroso. La noticia de El Periodico es poco más que un panfleto mitinero en plan “¡Al loro que no me les embauquen! ¡Que no estamos tan mal!” camuflado detrás de datos numéricos de poca importancia, claramente sobreponderados en su análisis. La realidad, amigos, es que por el camino que vamos, la deuda privada se convertirá en pública a medida que los vencimientos de deuda se vayan produciendo, y la ingeniería contable para evitar poner de relieve la depreciación de los activos no se pueda sostener. Esta tendencia ya es Vox Populi en los mercados financieros, la pregunta es ¿Haremos algo para que los responsables paguen los platos rotos? ¿O pagaremos los ciudadanos renunciando a todos nuestros derechos sociales para que algunas entidades financieras con altos índices de morosidad puedan sobrevivir a su deuda exterior? En definitiva: ¿Estamos dispuestos a pagar más impuestos para que el estado pague esa deuda exterior mientras nos recorta pensiones, servicios, y mantiene una organización funcionarial privilegiada propia de la edad de piedra? Debemos hacer todas estas reflexiones porque ya hay una agenda preparada por los grandes partidos y grupos de poder, para que los que paguemos el pato seamos los de abajo. Fijaros bien en las declaraciones de los políticos de la última semana: todos con su mensaje de partido, pero en la misma dirección. Nos van a intentar acojonar haciéndonos creer que les necesitamos, porque realmente no es así y están viendo peligrar sus sillas. Pero hemos de recordar una cosa: el valiente lo es hasta que el cobarde quiere. El país es nuestro, no suyo. No lo olvidemos. PD: el asunto en Grecia se complica, el vice primer ministro de Grecia ha mandado a la mierda a los alemanes, y les ha mentado la segunda guerra mundial. Obviamente, eso esfuma las pocas posibilidades de rescate europeo sobre ese país. Los alemanes son buenos pagadores, pero que después de 60 años les recuerden su pasado Nazi... y luego les pidan "favores"... Me parece que volvemos a la opción de la quiebra de Grecia y rescate del FMI. Los alemanes ya han decidido que prefieren salvar a aquellos de sus bancos que hayan invertido en Grecia, antes que financiar el nivel de vida de los griegos. La GRAN banca siempre gana, y el gobierno de paso también. Hace unos días, en medio de la crisis de la deuda griega, el señor Botín se afanó a defender la deuda pública española en unas declaraciones que a muchos nos parecieron sorprendentes. SAN, igual que el resto de entidades financieras españolas, tiene un enorme volumen de deuda española, y muchos pensamos que por eso era normal que la defendiera. Pero la vehemencia de su defensa no cuadraba con su tradicional prudencia en las declaraciones. Ya lo sabéis, si compráis un fondo de inversión inmobiliario, estáis comprando un producto de INVERSIÓN PERPETUA. ¿que las entidades financieras tienen problemas de capital? no importa, convertimos indirectamente unos cuantos fondos de inversión en "capital propio", dando la posibilidad de no devolverlo según necesidades de las entidades. Sin embargo, esta explicación es DEMASIADO simplista, no parece que la situación de SAN exija que se realice una modificación legislativa mediante Decreto Ley (la más urgente de todas, y la menos transparente) rasquemos un poco más para ver cual puede ser el fondo de la cuestión. Lo primero que nos debemos preguntar es: ¿Que repercusiones tendrá esto? Para empezar, las gestoras de fondos no creo que capten mucho más capital a partir de ahora... y probablemente pierdan bastante si se publicita esta medida. DE MOMENTO SOLO LOS FONDOS INMOBILIARIOS se verían afectados, pero como en el tema de las pensiones, una vez abierto el procedimiento legislativo, no se sabe qué se puede modificar... La tan temida inseguridad jurídica acechará la legislación de los fondos. Aviso: ENTRAMOS EN EL TERRENO DE LAS HIPÓTESIS. IMAGINEMOS que esa reforma se acaba generalizando al resto de fondos de inversión. Se eliminaría la posibilidad de una fuga rápida y brutal de fondos de las gestoras españolas, grandes poseedoras de deuda pública. Sé que es un poco conspiparanoico, pero todo cuadraría, y se entendería mejor la prisa en hacer esta reforma urgente. Esta ley, además de un favor al Señor Botín, podría convertirse en la punta de lanza de una maniobra indirecta para proteger la deuda española de las ventas masivas en los fondos que invierten en nuestros bonos. Si Grecia se hunde, los fondos que han invertido en deuda española probablemente también se hundirían, provocando órdenes de venta masivas. Si hay ventas masivas, la rentabilidad de los bonos se dispararía, es decir, el interés que pagaría el estado por esa deuda se dispararía, y los seguros de impago de la deuda española también, y si eso ocurre las acciones de los grandes propietarios de bonos (gran banca) también se irían por el retrete. La deuda pública es el activo más líquido de todos los fondos, si se retira el dinero masivamente, lo primero que venderán los gestores serán los activos de deuda pública, a menos que se les permita no reintegrar a los partícipes. Si lo han hecho para pagar un favor al señor Botín, ¿no lo harán para defenderse a si mismos?. Si hay una crisis de deuda pública, lo mejor para el gobierno será evitar por ley que la gente saque dinero de los fondos a lo bruto, aunque perjudiquen el negocio de las gestoras. Estaríamos hablando de un semi-corralito, completamente legal, ya probado con BANIF inmobiliario, y encima nadie podría decir que no le reintegran sus depósitos. Habría un debate "léxico" sobre si eso es o no es un corralito pero, probablemente, podrían salvar la situación. Los últimos meses hemos dicho que el gobierno español ha vivido en los mundos de yupi, negando la situación real de nuestra economía ¿Es posible que ya hayan aceptado al menos la posibilidad de que haya una crisis de deuda pública en el sur de Europa? Yo creo que SI, y el viaje a Londres que hicieron Salgado y Campa lo demuestra. Es una ofensiva mediática en toda regla para que esa posibilidad les afecte lo menos posible, y lo más tarde posible. Si realmente pensaran que estamos "libres de pecado" no se presentarían en Londres a dar explicaciones. "Excusatio non pedita, acusatio manifesta". Volvemos a decir que es verdad que la situación española y la griega son diferentes, pero no tanto por el tamaño de la deuda (la Española per cápita es incluso superior), como por el hecho de que en España el problema es la deuda privada (la pública supone un % pequeño del total) y en Grecia tienen un problema de deuda pública (aunque su deuda privada es inferior a la nuestra). Si no se dejan caer entidades financieras zombis, y se las avala (cosa que está haciendo nuestro gobierno), la distinción entre deuda privada y pública desaparece. Por lo tanto no es extraño que se nos compare con Grecia, porque ejecutamos políticas económicas que nos acercan peligrosamente a ellos. Repetiré hasta la saciedad que dejando caer entidades sobreendeudadas y con exceso de activos de dudoso cobro, solucionariamos gran parte del problema de la deuda privada, y por lo tanto también solucionariamos las dudas que hay sobre la deuda pública. Si hicieramos eso, nadie nos compararía con Grecia. ¿Qué ha producido esta aceptación por parte del gobierno? ¿Porque empiezan a darse cuenta de que la crisis en España no va a ser igual que en otros lugares? Primero: Alemanes y franceses directamente "pasan" de España cuando van a planear rescates, y eso que somos flamantes presidentes de la UE. Es obvio el porqué: no le vas a dar la información de la estrategias de rescate a un país de los más que posibles rescatados, eso sería dejarle jugar con las cartas marcadas. Segundo: 7 de cada 10 alemanes no quieren poner ni un duro para rescates, y el gobierno de Merkel no está para muchas medidas impopulares. Tercero: El interés que el estado tiene que ofrecer para vender sus bonos es cada vez más alto. Este ejemplo es de bonos a 3 años, pero ocurre en todos los plazos. Si los costes financieros del estado se disparan, todavía habrá más déficit y aún más deuda. Una espiral que conduce directamente a la suspensión de pagos. Cuarto: Relacionado con el punto 3. Los seguros de impago de la deuda española suben peligrosamente. En resumen: el lobo se asoma, y parece que empiezan a tomar medidas. Pero en lugar de tomarlas a favor de los minoristas, de los ciudadanos, o del interés general, las toman a favor de ellos mismos y de aquellos que acabarán "reconduciendo" la liquidez del BCE y de los ahorristas hacia la deuda pública. Eso sí, vendiéndolo como que hacen un favor a la banca (un chivo expiatorio muy conveniente). En realidad solo los grandes banqueros se benefician, porque pactan con el gobierno el tempo de las reformas legislativas en cuestiones económicas. La inseguridad jurídica no beneficia a ningún banquero honrado (haberlos haylos) ¿Acabará siendo el Santander al gobierno de España lo mismo que Goldman Sachs al gobierno de los USA? El tiempo lo dirá. Para terminar, una "lucha rapera" de los dos "gurus" económicos de las dos escuelas de macroeconomía principales: Keynes (escuela keynesiana) y hayek (escuela austriaca). Si sois frikis de la economía (algo probable si leéis este blog) os hará gracia. En economía, la moneda tiene el valor que las personas le damos. Es un valor completamente subjetivo… o no. Durante mucho tiempo las monedas eran de oro y plata, algo que la gente atesoraba como intrínsecamente valioso. La sal (de ahí la palabra salario), las especias, los vellones de lana, etc. Siempre ha habido una riqueza real respaldando las divisas. El patrón bimetálico (oro/plata) funcionó bastante bien durante mucho tiempo, hasta la explosión del crédito y las inmensas necesidades de acumulación de capital, que una sociedad industrializada requiere, hizo imposible que eso funcionara. Pasamos al patrón oro con sistema fraccionario (multiplicación de dinero bancario, coeficientes de caja muy bajos que permitieron multiplicar la masa de crédito, etc.). Pero ni siquiera la moneda fraccionaria permitió aumentar la masa monetaria lo suficiente para sufragar el gasto público y generar inflación. Había que librarse del oro. En ese entorno, se adoptó un patrón muy propio para la economía del momento. ¿Cuál es el bien primario más utilizado en el comercio internacional? EL PETROLEO. ¿Y para que sirve? PARA OBTENER ENERGIA. La energía permite tener coches, grandes autopistas, permite alimentar fábricas, trenes, aviones, megaedificios de oficinas y enormes megalópolis. La energía es riqueza. La conclusión obvia es que las divisas debían valorarse siguiendo un patrón energético. Tanto tienes, tanta energía puedes comprar, tal es tu nivel de vida. Y el precio de tu divisa respecto del petróleo sirve de referencia. Por eso no es casual que los telediarios hablen muchas veces del precio del petróleo, a pesar de que ese precio no supone ni el 20% del precio de la gasolina para el consumidor final. Si suben la gasolina con la excusa de que ha subido el petróleo nos están mintiendo. Solo el queroseno de los aviones, y el gasóleo para pesqueros y agricultores, está a precio “normal”. Pero todo eso está cambiando. Esta crisis es una crisis de deuda exterior de occidente, compramos muchas cosas fuera y en cambio no nos compran nada. Salvo excepciones como Alemania y Japón, prácticamente todos los países occidentales tienen déficit comercial. Tomando occidente como conjunto, se ve claro que gastamos por encima de nuestras posibilidades de producción. Un gasto sufragado a través de crédito, crédito que no para de crecer y crecer, hasta que ha llegado el momento en que no puede crecer más. Las subprime, las quiebras bancarias y empresariales, las estafas financieras globales, la invención de múltiples derivados financieros… todo eso podía drenar “algo” de dinero, retrasando lo inevitable: nadie puede incrementar su deuda frente el exterior “ad infinitum”, antes o después hay que volver al equilibrio o tu país pasará a manos de otros. Antes vimos que todos los patrones monetarios han perecido cuando se llegó a su límite inflacionario. Parece que el patrón energético tocó ese límite en verano de 2007, no se puede imprimir más moneda (directamente o inflando el crédito) sin disparar el precio del petróleo (llegó a los 150 dólares), no se puede incrementar la masa monetaria sin destrozar la economía productiva por una pura y simple carencia (o carestía, que en el fondo es lo mismo) de recursos energéticos primarios. En definitiva: no hay suficiente petróleo como para que las divisas sigan basándose en él. La economía global es demasiado grande, y ya no se sustenta tanto en la industria pesada: ha dejado de tener sentido el patrón energético que tan bien funcionó en la sociedad industrial. Y si fomentamos otras fuentes energéticas (renovables o nuclear), la energía se abarata o es gratuita al ser infinita, entonces el reciclaje de materias primas es más barato que la extracción minera. Ni siquiera los salarios de miseria del tercer mundo permitirán rentabilizar la extracción de metales o petróleo, si los coches eléctricos pueden recargarse gratis y se construyen con materiales reciclables al 100%. La energía, NO VALE NADA, gracias a las renovables. En los mercados de mayoristas el megavatio ha llegado a subastarse a cero euros. Parece una locura, pero no lo es. Una vez tienes los molinos construidos, la presa hecha, etc. La energía es perpetua y gratuita, ya que la uses o no la uses, te cuesta lo mismo. Un patrón energético es imposible si el respaldo físico carece de valor. Y el respaldo carece de valor cuando se ejecutan las políticas económicas adecuadas para que lo pierda, que es lo que se está haciendo ahora. Si producir cuesta lo mismo que no producir, el precio del producto final tiende a cero por la presión a la baja de los ofertantes. Si el estado construye los molinos (o los subvenciona) la presión en la oferta energética empujará los precios hasta cero inevitablemente porque la oferta superará la demanda. Hay que tener claro que es una decisión política, tomada para evitar que la importación de materia prima suponga la descapitalización de nuestras sociedades. Veamos quienes son los beneficiados y los perjudicados por este cambio. - Beneficiados: los países y sociedades importadoras de materias primas (entre ellas el petróleo), que poseen las tecnologías de reciclaje y generación de energía renovable. - Perjudicados: los países que viven de la exportación de materias primas. La importación de materias primas ha destrozado las balanzas de pagos de occidente en los últimos años, enriqueciendo a los caciques del tercer mundo. Pues bien, occidente ha decidido por unanimidad dejar de importar, fomentar la autosuficiencia energética, y “de facto” convertir a los países exportadores de materias primas en polvorines de pobreza y guerra. De momento, Arabia Saudita ya avisa de que si no consumimos petróleo tendremos que financiarles. Y Venezuela devalúa su divisa porque la bajada del precio y de consumo del petróleo les está destrozando la economía, ya que era prácticamente su única fuente de divisas. En África, cuya situación económica es aún peor, veremos florecer la violencia étnica, porque quitarle a los caciques su dinero y su capacidad adquisitiva no suele tener buenas consecuencias para los “súbditos”. Occidente puede financiar su déficit comercial emitiendo deuda “barata”, los países pobres no pueden emitir deuda en divisa local, ya que solo les compran deuda denominada en dólares o euros, lo cual les aboca a la ruina más absoluta en poco tiempo. La única solución sería realizar transferencias tecnológicas al tercer mundo, para que pudieran ofrecer servicios y productos complejos sin tener que importarlos, pero si bien eso puede ser posible en parte de Asia y Suramérica, parece imposible en el caso de África. En resumen: energía barata e ilimitada => reciclaje y reducción brutal de las importaciones de materias primas => equilibrio (e incluso superávit) en las balanzas de pago de TODO OCCIDENTE => miseria generalizada en el tercer mundo => guerras y violencia étnica => cierre de fronteras de occidente. Pero volvamos al tema principal de este texto, ¿Cuál será el nuevo patrón de divisa? Los gobiernos necesitan que sea algo cuantificable, algo SOBRE LO QUE PONER IMPUESTOS. Metales preciosos, commodities (petroleo), ladrillo, tecnología, todo ha sido explotado al máximo, hasta el límite que el apalancamiento, la moneda fraccionaria y los derivados financieros más imaginativos han permitido, con las consecuencias que todos conocemos. ¿Qué nos queda? ¿Cómo resolverán los gobiernos la cuadratura del círculo para poder seguir inflacionando? ¿Qué más se puede tasar e introducir en la economía formal? Pensemos “¿en que sociedad vivimos?”. Sociólogos, politólogos, economistas… todos hablan de la sociedad de la información y el conocimiento. ¿Qué mejor patrón que la información? ¿Qué mejor patrón que la propiedad intelectual? Es ilimitada, por lo que para inflacionar solo deberías introducir en la economía formal más “trozos” de los pensamientos de los productores de contenido. Difícil de implementar, pero sencillo de mantener una vez implementado. Además, cualquier intercambio masivo de información deja rastro, es imposible escapar de un recaudador con medios suficientes. ¿No os habéis preguntado porque el gobierno permite que exista la SGAE? ¿Por qué se aprueba legislación en contra de la gratuidad de la descarga de contenidos de Internet? ¿Por qué los USA no ceden el control de las agencias que conceden los dominios .com? ¿Por qué telefónica gana juicios en contra de la creación de puntos wifi completamente gratuitos? Si consiguen poner impuestos en la generación de conocimiento (vía IRPF de los trabajadores que se dediquen a producirlo, beneficios de las empresas para las que trabajen, impuestos a las compraventas de derechos de propiedad intelectual, o incluso una tasación legal de ese conocimiento), podrán basar el valor de la divisa en esa capacidad impositiva. Ese cambio ya se está produciendo, Google, Facebook, etc no valen millones y millones de euros por que generen beneficios AHORA, sino porque la información que poseen se prevé que los genere en el futuro. La tendencia está ahí, por eso es importante que mantengamos la libertad en Internet. Es importante que procuremos no depender demasiado de economías de escala que puedan realizar prácticas monopolísticas sobre la información, cobrando lo que les venga en gana para que podamos disponer de información no sesgada y de primera mano. Porque me parece que a estas alturas, parece claro que ni las TV ni los periódicos de masas proporcionan ese tipo de información. 1.- Un blog podría tener que pagar por publicar un post, igual que tienes que pagar por publicar un anuncio. 2.- Una persona podría tener que pagar una tasa por enviar emails, igual que tienes que pagar por enviar un correo. Suena muy raro, lo se, pero ¿acaso veis vosotros otra salida para los gobiernos que no incluya una revolución y guillotina para todos ellos? El déficit comercial no se puede mantener y la reconversión industrial hacia las renovables hay que hacerla. Pero una sociedad donde la economía no crece provoca que el estado rápidamente se quede sin un duro (como pasa ahora). Si los productos necesarios bajan de precio y en consecuencia los sueldos también, si muchas cosas que se compran y venden, dejan de comprarse y venderse, o su precio baja… ¿Quién pagará impuestos? ¿Quién mantendrá el tinglado? Como siempre, la mejor alternativa sería liquidar deuda, y evitar que el estado tenga que inflacionar continuamente para financiar los servicios públicos, ¿Cómo? Mejorando la eficiencia de las administraciones públicas, tanto mediante la automatización del trabajo de ventanilla, como mediante la reducción del número de niveles administrativos (en Cataluña tenemos cuatro: gobierno, ayuntamientos, comarcas, y Generalitat, y quieren introducir un quinto, las veguerias), creando un sistema que asegure la justicia fiscal e impida el expolio sin límite de determinadas regiones a favor de otras. Sin embargo, parece que ese no será el camino por el que nos llevarán, sino que nos obligarán a pagar por pensar y por acceder a los pensamientos de otros. La UE parece que no va a dejar al FMI el papel de “poli malo” en Grecia, como preveíamos en un post anterior. Y piden que se reduzca el sueldo de los funcionarios, entre otras cosas, para reducir el déficit. Ya hay ideólogos que empiezan a publicar abiertamente que si la cosa sigue así en los PIGS (Portugal, Italia, Grecia y Spain) con déficit desbocados que nos llevan directamente a la suspensión de pagos o a la inflación, podría ser que Alemania (y Francia) abandonaran el euro si no se llevan a cabo políticas de austeridad necesarias en los paises del sur. Parece más factible que salgan Alemania y Francia, el euro se devalúe via inflación frente al neoFranco y el neoMarco, reduciendo en el proceso las deudas exteriores de los países del sur, y luego los países de la Europa productiva volvieran a entrar (o no) en el euro. Eso si, sin la Europa central, el euro sería poco más que una lira-peseta, es decir una divisa-basura. Pero esa solución es “mejor” para todos, es mejor que permitir que media Europa entre en suspensión de pagos. Tambien es mejor eso para Alemania, un país dependiente de la industria pesada (y por tanto de la acumulación de capital) que condenaría a su tejido industrial a desaparecer rápidamente por los desequilibrios que la inflación provocaría, entre otras cosas subidas brutales de tipos de interés que directamente impedirían solicitar los créditos necesarios para construir las fábricas, al elevar muchísimo los costes financieros. Por nuestro lado, se atrasa la edad de jubilación, y lo que es más importante (aunque nadie dice nada) en ciertos supuestos SE ELIMINARA LA PENSIÓN DE VIUDEDAD. Teniendo en cuenta que muchas mujeres de edad avanzada no han cotizado en su vida, y que las mujeres viven 8 años más que los hombres de media, es mucho más dinero eliminar las pensiones de viudedad que atrasar la jubilación a los 67. De momento el texto no implica eliminaciones de la viudedad si hay hijos, o “larga convivencia” (concepto un poco ambiguo), pero la veda está abierta. Esto es grave, porque el estado ya dice que no va a honrar un contrato, el que adquirió con los cotizantes. El estado dice que no hay dinero para pagar las pensiones tal y como están escritas, tal y como la gente que ha cotizado pensaba que iban a ser. Una empresa NO PODRÍA HACER ESTO sin declarar suspensión de pagos. ¿Os imaginais que cuando te jubiles la empresa de tu plan de pensiones te diga “hey, que te voy a pagar la mitad de lo que te toca, porque sino no hay dinero para todos, y que sepas que si te mueres antes de jubilarte tu mujer/marido no verá ni un duro de todo lo que me has ido dando”? Pues eso es lo que están proponiendo… reconociendo “de facto” que se han gastado el dinero de los cotizantes en otras cosas y que ese dinero ha desaparecido y no pueden honrar los contratos adquiridos, eso, en el mundo empresarial, se llama BANCARROTA. Hace unas semanas hablamos de la posibilidad de colapso en los mercados de deuda pública de la zona euro, ya que muchos países se acercaban peligrosamente al límite que los mercados consideran aceptable. Hay dos opciones para solucionar el inevitable descalabro: el BCE imprime dinero, inflaciona, y financia sin límite los estados con problemas, o el FMI (es decir los Estados Unidos) se “mete” en esos países e IMPONE políticas económicas de austeridad y de eliminación del estado del bienestar. Obviamente un estado siempre preferirá la ayuda del BCE, a tener que pedir que el FMI te imponga condiciones draconianas a cambio de financiación. Pues bien, el FMI ya ha abierto una sucursal en Grecia. El BCE (es decir alemania, Francia, y Holanda), tal y como amenazó, se lava las manos y NO VA A AYUDAR A LOS países con problemas. Es cierto que la situación de la deuda publica griega y las finanzas del estado griego son mucho peores que las de España. La situación griega es tan mala, que hasta han sido sancionados por manipular las estadísticas de déficit de años anteriores. Pero si consideremos la deuda publica y privada en su conjunto, la deuda neta exterior española per cápita es SUPERIOR a la griega, y recordemos que el estado español esta avalando cantidades enormes de deuda privada de entidades financieras frente al eurosistema. Esa ingente deuda privada puede fácilmente convertirse en deuda pública. Por otro lado, ya se ha encargado, realizado y publicado un “informe técnico” sobre las posibilidades de expulsión de la zona euro y de la Unión Europea de aquellos países que se considere oportuno. El informe básicamente dice que UNA EXPULSIÓN es viable, y lo que es más preocupante, dice que si bien sería necesario una salida negociada, NO ES IMPOSIBLE UNA EXPULSIÓN UNILATERAL. “A buen entendedor pocas palabras bastan” dice el refranero español: el que tenga problemas para pagar sus deudas que se ponga en manos del FMI (con todo lo que eso supone), y al que no pague se le expulsa del club europeo, o se le veta el ingreso (como pasa con Islandia). Ya todo el mundo reconoce que hay un montón de cajas que no son viables, y eso que todavía sus activos inmobiliarios no están contabilizados a precio de mercado, veremos de donde sacan el dinero para “viabilizarlas”… Esperemos que la acción del FMI en Grecia sea lo suficientemente contundente, como para asustar a nuestro gobierno y que haga lo que debe hacer: dejar caer empresas quebradas inviables, liquidar deuda exterior privada sin convertirla en deuda pública, y dejar de alimentar estómagos agradecidos en las cajas políticas. La alternativa a eso es “ir tirando” un año más, hasta que los mercados financieros interpreten que nuestra deuda pública es una mierda, y las agencias de rating la califiquen de bono basura impidiendo que sirva de colateral para pedir dinero al BCE, lo que supondría de facto una suspensión de pagos del país (esto es lo que está a punto de ocurrir en Grecia, y por eso han solicitado ayuda al FMI). Pedir ayuda al FMI es ceder el gobierno económico del país a los americanos, y ya sabemos lo que ha ocurrido en los países que lo han hecho: pobreza, desigualdad, deterioro de los servicios públicos, crimen, y emigraciones masivas. Mientras todo eso sucede, y no hacemos nada, el resto del mundo se ríe cuando pretendemos liderar la salida de la crisis económica en la presidencia de la UE. PD: para aquellos que se pregunten ¿Cómo es posible que España funcione de esta manera? ¿Cómo es posible que una “democracia” vele tanto por los intereses de los ricos de siempre, y no de los ciudadanos? Os recomiendo que veáis este video (y los subsiguientes) sobre la “fenomenal” transición española y sus consecuencias. Es un video de los años 90, cuando las televisiones privadas todavía no eran sociedades cotizadas, y por lo tanto no estaban 100% controladas por el gran capital. Una de las últimas esperanzas del actual “status quo” de la economía española era que la deuda exterior se corregiría vendiendo a los extranjeros los pisos, que hemos construido con el dinero que otros extranjeros nos prestaron. Pues bien, parece ser que los “tochos españoles” no interesan ni vendiéndose en subastas sin precio de reserva, como se puede ver en esta noticia. Por si no queréis leerla, resulta que se tuvo que cancelar una subasta de inmuebles en Londres, porque solo aparecieron 30 curiosos a ver como iba. Y claro, una subasta sin precio de reserva… podía acabar en una venta de un piso por un euro. Si atendemos a los mecanismos de mercado “ortodoxo”, una subasta es ideal para conocer el precio de equilibrio entre oferta y demanda en un determinado momento, ya que el precio va subiendo hasta el momento en que la demanda desaparece. Conclusión: gran parte del stock de segundas residencias en España (la subasta era de viviendas en la costa) vale MUCHO MENOS que su coste de construcción y financiación, y los propietarios se resisten a venderlo. De hecho, atendiendo al resultado de esa subasta, podríamos decir que valen casi cero euros, pero intentaremos ser optimistas y pensar que si la subasta se hubiera realizado, algo se habría vendido. En España la situación tampoco es mucho mejor, incluso para primeras viviendas. 180000 ejecuciones previstas para el 2010, y ni siquiera los subasteros van a por los pisos, cuando el precio de salida es del 50% del precio de tasación. Menudos son los tasadores que dan un precio “real” de mercado, que nadie esta dispuesto a pagar. ¿Acaso el precio real de mercado no es el que la gente esta dispuesto a pagar? ¿Quién tiene razón, el mercado real, o los tasadores? El mundo al revés, y luego dicen que hay libre mercado de la vivienda… Se está intentando contener la bajada de los activos inmobiliarios a toda costa, EN CONTRA DE LAS LEYES DEL MERCADO LIBRE, dando dinero a los bancos para que se compren a si mismos los inmuebles con las menores pérdidas posibles. Por si no lo sabéis, en las “estadísticas” del ministerio de la vivienda, las compras de viviendas en subastas por parte de los bancos también figuran como compraventa… lo cual explica porqué esta subiendo esa estadística los últimos meses: sencillamente el número de daciones de pago y subastas no hace más que subir. Pero nos quieren vender que el mercado se está revitalizando. Veamos como es posible que en ese entorno los bancos sigan ganando tantísimo dinero, muy sencillo: debido a las inyecciones de liquidez del BCE. El Señor Trichet les presta a los bancos TODO el dinero que quieran al 1%, con ese montón de dinero los bancos y cajas pueden financiar sus provisiones, y encima ganar dinero cobrando intereses ¿Cómo? Pues con operaciones de deuda pública que inflan sus balances sin riesgo teórico. Pido dinero al 1% al BCE-> compro deuda pública al 3%-> gano un 2% limpio de polvo y paja. Por si no lo sabéis, los activos de deuda pública son considerados de máxima calidad por los bancos centrales de cada país, por lo que no obligan a provisionar ningún tipo de riesgo. Aumentas el balance (reduciendo los ratios de morosidad), ganas un montón de dinero, y sobre el papel reduces riesgo (luego veremos como esto no es así, y las administraciones también tienen riesgo, aunque el banco de España no obligue a provisionarlo). Así se matan dos pájaros de un tiro: se gana un montón de pasta, y se financia indirectamente el déficit de los estados de la Unión Europea. ¿Qué problema tiene esto? Lo habéis adivinado, ese 3% de costes financieros para los estados es dinero de los contribuyentes, y la deuda pública son impuestos a futuro, es decir, si se pretende pagar habrá que subir muchísimo los impuestos los próximos años. La teoría dice que si las inversiones del estado fueran productivas es posible que esa deuda fuera pagable, pero es que ¡! !están usando el dinero para avalar a bancos y cajas en problemas!!! Es decir, hay bancos y cajas que están tan mal, que ni siquiera el pelotazo “1% BCE- 3% deuda pública” les sirve para compensar las pérdidas mil millonarias que la morosidad les está provocando, teniendo que pedir miles de millones al FROB en participaciones preferentes. Por si no lo sabéis, las participaciones preferentes solo pagan intereses si se obtienen beneficios, y las entidades que acuden al FROB YA SABEN que no los van a tener… ¡! !El estado financiando GRATIS a entidades con problemas, y pagando un 3% a esas mismas entidades que compran bonos!!!!!! El negocio es aún mejor que el del BCE. El FROB y los avales del estado cierran el círculo de la “solidaridad financiera”. La entidades buenas ganan dinero comprando deuda publica (o deuda de ayuntamientos o autonomías) con dinero que el BCE les ha prestado, y confiando en que cobrarán… pero el estado usa el dinero de tal manera (dándolo a entidades zombies gestionadas por incompetentes, que han financiado proyectos empresariales irracionales) que convierte en posible un impago por parte del estado en sus diferentes niveles de la administración, que se llevaría por delante TODO nuestro sistema financiero, ya que no hay una sola entidad financiera española que no tenga una exposición brutal a nuestra deuda pública. Con esas mimbres, obviamente se suceden las noticias que alertan de la posibilidad de que las distintas administraciones no paguen sus deudas. Ojo a Cataluña, cuyas finanzas están por los suelos, y cuyo rating es inferior al de Castilla la Mancha o la comunidad Valenciana. Si atendemos a como funciona el Estado Español, vemos que la capacidad de establecer impuestos va de arriba a abajo, es decir, el que pone y cobra más impuestos es el Gobierno de ZP, luego las autonomías, y luego los ayuntamientos. Es por tanto lógico que los primeros en quebrar sean los ayuntamientos, puesto que vivían de la venta de terreno municipal liberalizado (la famosa ley Rato), cosa que ya no pueden hacer, y encima no tienen capacidad normativa sobre los impuestos, salvo el IBI, con máximos legales (un 1,1% del valor catastral) que muchos ayuntamientos ya están explotando, por ejemplo Barcelona. Por cierto, en el borrador de la ley de economía sostenible han puesto una cláusula para permitir a los ayuntamientos subir el valor catastral anunciándolo únicamente en el BOE, sin avisar a los ciudadanos. Lo cual puede ayudar a los ayuntamientos a refinanciarse, a costa de subir el IBI indirectamente. Aún así, los intereses de la deuda de los diferentes niveles de la administración serán tan brutales, que difícilmente el estado del bienestar sobrevivirá. Tristemente, y si esto sigue así, los jóvenes que nos quedemos en España, nos quedaremos para pagar impuestos para financiar el dinero gastado en rescatar bancos y cajas mal gestionados. ¿No sería más fácil dejarlos quebrar y que los acreedores alemanes y holandeses se quedaran con los inmuebles y otros activos de las entidades zombies?¿porque hemos de pagar con impuestos lo que nadie quiere en las subastas? Una sola caja PEQUEÑA en problemas (CCM) se ha comido todo el fondo de garantía de depósitos. Si, si, ese que en teoría debe garantizar 100000 euros por depositante. Vamos, que no hay dinero para garantizar más depósitos si cae otra caja. Por otro lado, tenemos al banco de España avisando de 2 entidades en situación muy grave, y otras 6 en estado preocupante, sin decir nombres. ¿Cuáles son? Pues es bastante fácil de descubrir si atendemos a sus ratios de morosidad actual, y a las proyecciones de los stress test en caso de que el paro siga como está ahora (no digamos si aumenta). Viendo estas tablas, queda claro que Caixa Catalunya, Caja sur y Caja España YA ESTÁN AL LÍMITE. Su mora es igual que su capital, lo cual indica quiebra técnica o valor cero de su cartera conjunta de prestamos y depósitos. Y hay muchísimas otras que en el stress test dan un resultado a futuro (diciembre de 2009) muy similar. Se prevé que las cajas pierdan en su conjunto unos 10000 millones de euros en 2010. O mejor dicho, se prevee que ese año se verán obligadas a reconocer el deterioro de sus activos, que ya ha quedado patente en la tabla anterior sobre la morosidad. Por otro lado, vemos como el Banco de España ya avisa de que “habrá que hacer más aportaciones al FGD”. Porque ya se lo han pulido todo con lo de CCM, y hay cola para pedir más dinero. Es decir, que si nos descuidamos harán que las cajas que están bien (es decir, LaCaixa y algunas otras de menor tamaño), acaben pagando el pato de aquellas que declararán pérdidas mil millonarias, de las cuales más de una será intervenida. No se si estas “razones de estado” están detrás de todos los requerimientos que hace el BdE en cuanto a información detallada a todas las entidades¿acaso MAFO quiere tener todos los datos para saber cuanto pedir para el FGD? Por otro lado, esta semana tenemos que la deuda pública griega se acerca peligrosamente al rating de bono basura (a dia de hoy, 1 de febrero de 2010, la UE y el FMI ya modelan las políticas económicas griegas). El mercado pone un límite a la deuda pública en un 120% del PIB, lo cual deja a España un margen del 60% respecto a niveles actuales. Parece mucho, pero no es tanto si tenemos en cuenta que si suben los tipos del BCE ese margen bajará, y además la deuda NETA exterior española supone unos 900.000 millones, o un 90% del PIB aproximadamente, según datos del BdE (primera columna de la tabla del link), y CRECIENDO. Lo cual hace ver la imposibilidad de que el estado sufrague la deuda exterior del sector privado. Al mismo tiempo, la posición neta del banco de España no para de disminuir. Al ritmo actual, a España le queda un año y medio de margen para reequilibrar sus finanzas (públicas y privadas). Si algún país de nuestro entorno, como Grecia o Portugal, declarase suspensión de pagos. Ese margen podría desaparecer en semanas. Para reequilibrar las finanzas del sector privado, lo único que se puede hacer es que los que no pueden pagar declaren suspensión de pagos y se liquiden deudas impagables, y no que los pocos que aún son solventes paguen solidariamente los desmanes de los que han gestionado mal sus organizaciones y capital. Sencillamente, los que lo han hecho mal son más, y no hay manera de que los que están bien puedan con toda esa deuda. Si seguimos por el camino de mantener el “tinglado” y los “estómagos agradecidos” a base de endeudamiento público, nos iremos al hoyo TODOS no tardando mucho. Un 8% de morosidad es a todas luces insostenible, muchas entidades están quebradas de facto, y estarán en los juzgados por suspensión de pagos antes o después.